It’s 12″x 11-1/4″ x 2-1/4″. It weighs less than 8 pounds* And costs less than $1,300** Yet with 128K, the new Apple® IIc Personal Computer is a lot bigger than it looks. Because it’s inherited all the talents of the eminently talented Apple IIe: The versatility to run over 10,000 different software programs. The ironclad reliability of the first, true VLSI motherboard. And the artistic ability of 16 high-resolution colors. The IIc also has some talents of its very own. For instance, a switchable 80/40-character display. A built-in half-high 143K single-sided disk drive. Built-in serial ports for modems, printers and an extra half-high drive. Even built-in mousetronics so it’s ready to use a mouse and all the new Apple II mouseware. And our newest brainchild is certainly not an orphan. You can grow it with a whole family of Apple II accessories and peripherals. Including the new Apple Scribe—Apples first full-color print-on-anything printer for under $300, it can handle anything from business graphics to term papers. The IIc’s father, of course, is the granddaddy of the whole personal computer industry, the Apple IIe. Which, lest we forget, has quite a few improvements of its own this year. The IIe can now use our Profile™ hard disk — so it can store about 2400 pages of anything you ‘d like to remember. And the Apple IIe is still the most expandable personal computer there is. You can increase its RAM to an elephantine 512K. Add a Z-80 card to run CP/M.™ In fact, you can grow it with enough cards and peripherals to run just about any family business. Like Saudi Arabia. 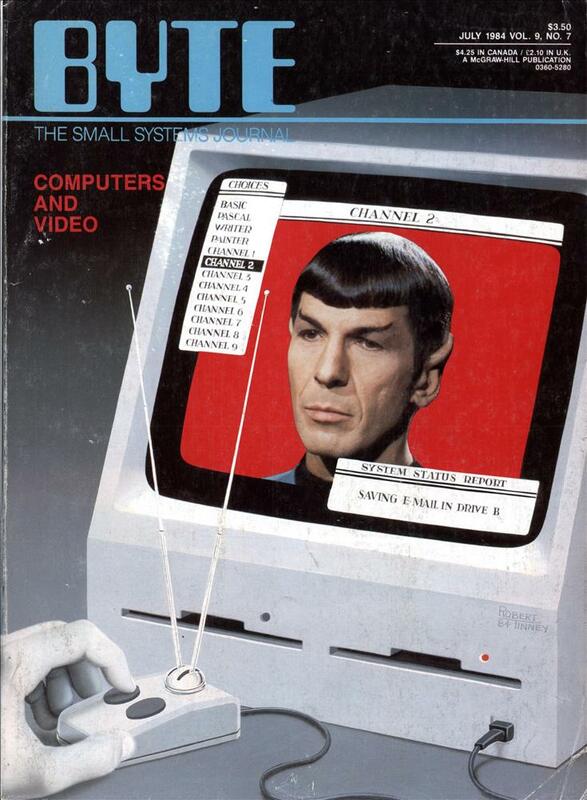 So you see, the only question is whether you need an expandable Apple II. As in IIe. 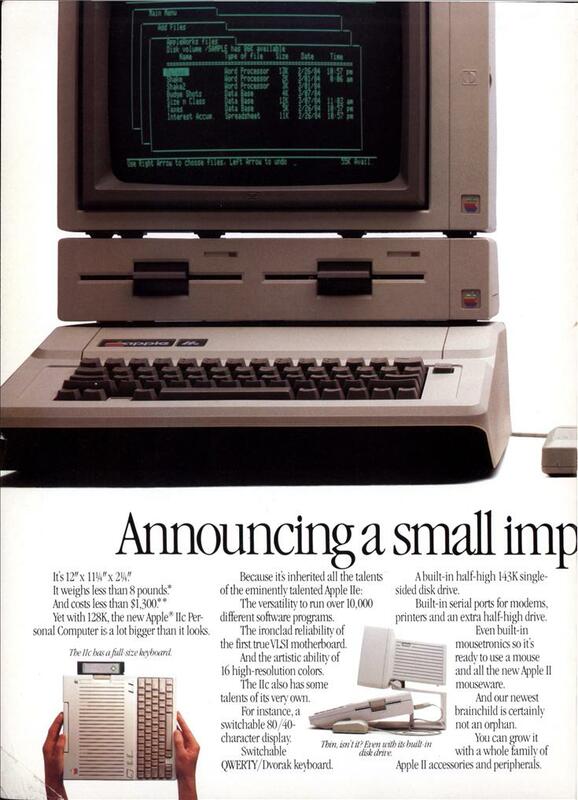 Or a compact Apple II. As in IIe. Just visit your friendly authorized Apple dealer. And tell them what size improvement you’d like. @ Toronto – Maybe they were going for the Disney market? @fluffy: That’s because it was really hard to read text on a color monitor. Even on the IBM, having a MDA – or better, a Hercules card – and a CGA in the same box was almost required to develop and test code. I always found the IBM CGA TTL monitor to be perfectly readable in text mode. The reason I always liked having a CGA+MDA dualhead setup was so I could run the app on one screen and the debugger on the other. Composite NTSC monitors were trash, though, yeah. Compsite monitors, were not worth looking at. I remember most of the color monitors were so round, they seem to look funny. The mono’s wern’t much better, but with the green you could use them all day. I was just out of High School when these came out. I did’nt know then that Dot pitch was the problem with those color monitors. Still Pac Man was just better in color! !